POSH LATEST: Nichols makes Posh debut, but strike partner Souleymane is the one to excel. Tom Nichols in action for Posh at St Neots. Photo: Joe Dent/theposh.com. New striker Tom Nichols played 75 minutes as Peterborough United Reserves thumped St Neots 5-1 in a friendly last night (February 2). But, despite enjoying some classy moments, the 22 year-old failed to find the back of the net. Souleymane Coulibaly, one of Nichols’ rivals for a first-team slot, scored twice as did Andrew Fox. Teenage central defender James Goode completed the scoring as Posh took control of the game in the second half. Coulibaly opened the scoring on 12 minutes following an excellent firts touch and an accurate strike into the corner of the net, but it took an excellent goal-line clearance from Harry Beautyman to preserve the lead. Beautyman played at centre-back in a starting line-up that included no natural defenders. St Neots hit the bar before equalising 10 minutes later. Nichols saw his best opportunity of the match kicked away by the home goalkeeper. Coulibaly saw two goals disallowed before Goode’s header from a Marcus Madison corner crept over the line to give Posh the lead again on the hour mark. Two minutes later another Maddison corner was fired home by Fox, before a terrific pass from Nichols was followed by a fine finish by Coulibaly. On 62 minutes, Posh extended their advantage as a driven corner from Maddison was met by Andrew FOX who fired home with his left-foot from around 12 yards. Fox grabbed his second of the evening 10 minutes from time as he forced his way into the box and unleashed a powerful drive into roof of the net. January signings Adil Nabi, Callum Chettle and Aaron Williams also started the game. 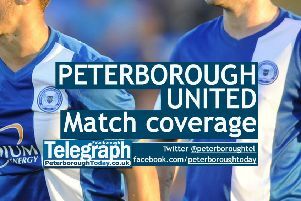 Posh: Henry, Da Silva Lopes (sub Maslen-Jones 75min), Nicholson, Chettle (sub Lee 46min), Beautyman, Fox, Coulibaly, Nabi (sub Goode 53min), Nichols (sub Moore 75min), Williams, Maddison (sub Lucan 75min). Unused sub: Elsom.